It is possible to determine the maximum length and area of a center Pivot for a certain set of conditions or, for planning purposes, to find out if an existing pivot can be used for a certain crop. Three pieces of information are necessary for the formulas in order to make the calculations. The crop requirement can be obtained from a local consultant, extension agent or university. Use the maximum value for the season which generally occurs when the crop has reached its full size and is just beginning to mature. The number will be expressed in millimeters per day. Along with the crop requirement, the infiltration rate of the soil and the pattern diameter of the sprinklers on the pivot are needed. The sprinkler diameter can come from the manufacturer’s catalog or it can be measured in the field. If a field measurement is used, be sure the nozzle size and pressure are the same as the situation for which the calculation is being made. The infiltration rate of the soil is probably the most difficult to measure and the least accurate of the three values needed for the formula. The infiltration rate of the soil is not the same for all parts of the field nor is it even the same at one point all of the time. It’s usually measured as the depth of water in inches that will penetrate the soil surface in an hour. The rate is high when the soil is dry and decreases as the soil wets until it reaches a constant rate. This constant is the number to be used in the calculation. The infiltration rate can be estimated if the soil texture is known and there are none of the sodium soil problems that are often found in arid climates. The infiltration rate can be measured a number of ways. A piece of pipe at least six inches in diameter and about a foot long can be driven vertically into the ground carefully to avoid disturbing the soil surface. The end of the pipe should be at least three inches below the surface. Fill the pipe with a few inches of water and keep the water level fairly constant for about eight hours. After the infiltration rate has reached its steady state, record the difference in water level in the pipe over a period of exactly one hour and that will be the rate to use in the center Pivot calculation. The accuracy of this procedure will be increased considerably if the pipe is placed inside a basin three feet in diameter that is also kept full of water. A second method to estimate soil infiltration rate is to use a sprinkler, perhaps even the pivot itself if it is already in the field. Operate the sprinkler for several hours if the soil is initially dry and then find an area under the sprinkler pattern where there is water ponding due to excessive application rate. The application rate at the edge of this ponded area should be very nearly equal to the infiltration rate of the soil. Place a number of rain gauges at these edges and measure the amount of water applied in one hour which will be equal to the soil infiltration rate. The minimum field size that can economically accommodate a pivot is about 40 acres. 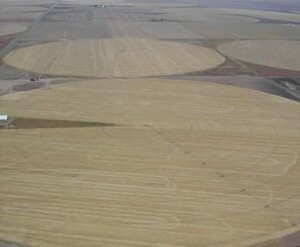 The center pivot is one of the most successful methods of irrigation in modern agriculture. Like the other varieties of sprinkler irrigation, the pivot must be properly designed to accommodate the conditions under which it will be operated.